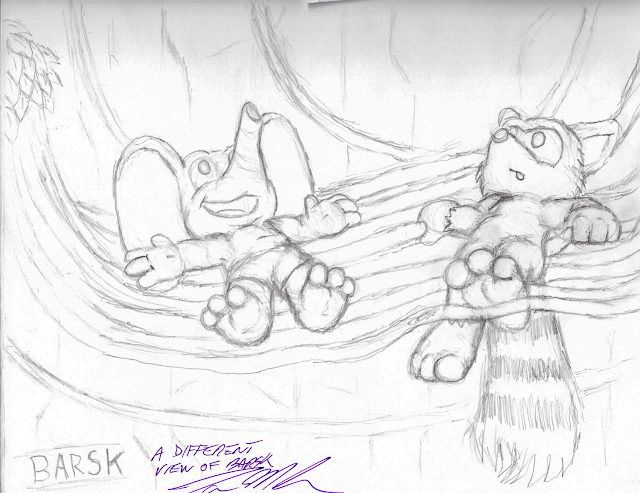 A thoughtful, approachable list of reviews and musings on anthropomorphic literature, concepts, and other media, all brought to you by a friendly blue raccoon! I’m not a fan of doing ‘where have I been’ posts, as they usually sound like a listing of excuses and also tend to carry kind of a negative vibe. You readers don’t come here to listen to me be upset with myself about slacking off, after all! The thing is, I consider myself to have two creative minds. On the one hand, I’m a writer. I love to make stories, read over different stories and opinions, and write down my thoughts. Readers here are probably somewhat familiar with that side of me already. On the other hand, I am an artist. You may have picked up on that from the various drawings I’ve done for this blog on particular stories that interested me, and from the few mentions I’ve made. I don’t actually talk about that side of me too much here, as I wanted this blog to be less about me and more about the media that I enjoy, but I’m finding it increasingly difficult to separate the two. In fact, separating my art and writing sides is something that causes its own types of problems. See, as much as I love to write and I love to draw, it’s actually very rare that I’m working on both equally at any given time. I will frequently get into ‘moods’ where one side is ludicrously dominant over the other for a set period of time. On the writing side, this leads to me doing big projects like writing a novel (or two!) and tackling writing prompts and experiments for a couple of solid weeks. 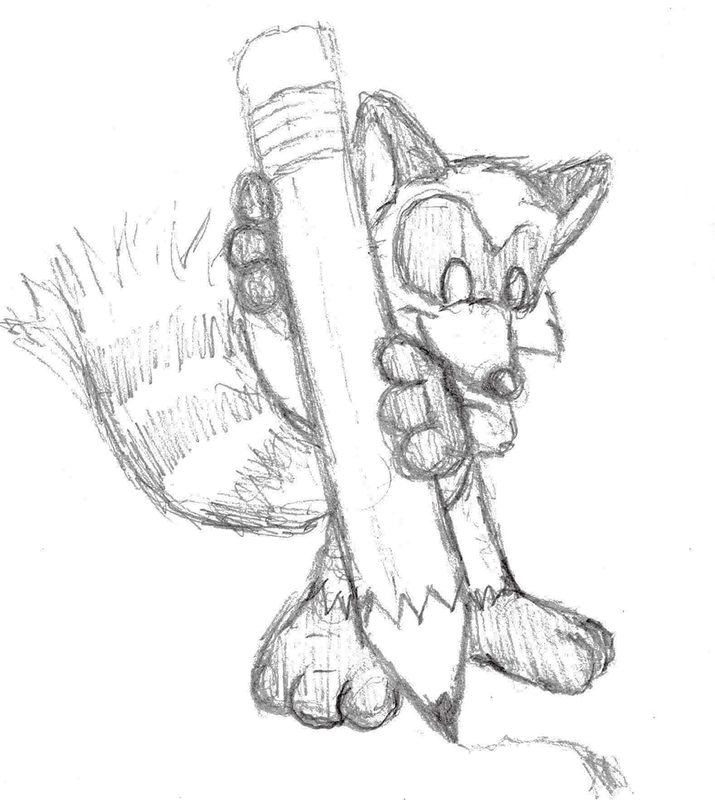 On the drawing side, this leads to me doing silly things like drawing a series of full page sketches based around a central theme that is often much greater than I’ll actually finish, or signing up to do public things like library bookmark contests and chalk art. Doing art is as much a part of me as writing and reading are. Perhaps even more so, as I’ve been drawing long before my handwriting became at all legible. I actually had aspirations of being a classic animator at one point, or even a comic book artist, but I stepped away from that to follow other career paths. Despite this, art is something that I love doing and seek to include it with my stories as I look toward publication. With that in mind, I’d like to take a little time and maybe a few posts to share some of my artwork and the ideas and stories behind them as well as the process that goes from conception to completion. 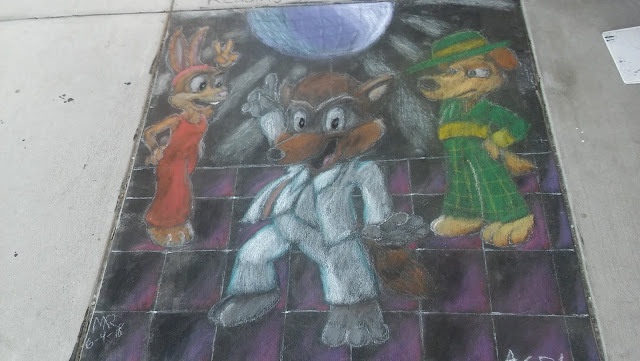 A short while back, while doing the chalk art that I showed off above, I frequently got into my own head and started berating my own skills and ideas, as many artists are wont to do. I was worried that someone would call me out for drawing cute animal characters rather than something more realistic. I was worried someone would mock my technique or approach to working with a larger canvas. I questioned my color-choice and composition and kept expecting someone to come along and snicker out some snarky comment behind my back to just take the wind right out of my sails… but that never happened. What I got instead were people walking up behind me and staring with amazement at the drawing coming to life before them. Little kids would come up and give an amazed ‘Wow…!’ or ‘That’s so cool!’ or even my favorite ‘How can I learn how to do stuff like that?’ All sorts of people came and had similar reactions, from old men and women to toddlers and teens who I thought wouldn’t give me a second glance. So many of them were so excited to just see me make art in front of them, and it finally struck me in that moment that art really is a miraculous thing and that simply being an artist takes a certain kind of bravery all on its own. So often, we artists tend to keep our heads in the sand of our communities and competitors, surrounding ourselves with other artists and plateaus that we aspire to. This goes for writers as well, by the way… I will frequently find myself looking at something I’ve done and then looking at a piece from Don Bluth or a drawing from artists I follow on Twitter and trying to figure out what I’m missing that keeps me from measuring up. That constant comparison creates this mindset that nothing is ever good enough and that we will always be second-rate or derivative of much better artists out there. Now, while it is great to have a mindset of desiring self-improvement and always seeking to better ourselves, I think it is also important to step back and realize that the simple fact that we are artists is pretty amazing in and of itself. We bring life out of a blank sheet of paper and can create entire realms, and it’s okay to be a little proud of that. That was what I discovered while I was doing that public art and having people being impressed behind my back, as well as from comments from various friends who are less artistically-inclined. It’s weird to say, but it’s a realization that feels kind of humbling, even though it’s about taking pride in my own work. I am a better artist now than I was before and, while it is great to have contemporaries to compare our work to and greatness to aspire toward, the real measure of progress is if I can say that I have truly improved myself. The real goal is looking forward to what I want to improve on in the future and how I can reach the goals that I set for myself. This goes for my fellow writers as well! Our success is measured by our improvements upon ourselves, not how we compare to others in our field. I may not be an artist like Jay Axer or a writer like Brian Jacques, but I can most certainly aspire to be a better version of myself. There's a story behind this one... but that'll have to wait for another day! I can totally relate to the feeling of being stuck in self-criticism mode, worrying that my own WIPs are either too derivative or too out-there, or that my style is too amateur to measure up to writers like Shannon Hale and Linda Medley. But then I remember that they were once amateurs, and probably still feel nervous whenever they start a new project. It's like Simon says in Medley's Castle Waiting Vol. 2: we all feel like kids whenever we try something new. Just a friendly raccoon working at the local library and writing his magnum opus (or whatever silly thing enters his head). Contrary to popular belief, I do not live in a trash can anymore!